What da ya think? Mr Beach House will have a fit, but his exact words to me this morning were, "I want no interruptions this weekend. It's a big one in football and I want to see every minute of it". I couldn't think of anything more boring. But I guess it's the same as me lapping up every minute of one of the house design programs I'm into. Well I'll show you Mr Beach House.....I too am pretty good at a bit of solitude. So I will be snuggling up in my new girly Spring bedroom with a good book or what ever takes my fancy, whilst you do your thing. Yippee!!!! I challenged myself to change out the room with existing stuff I had, so perhaps the cushions would not be my first choice here and I grant you it's all a little full on, but the whole thing didn't cost a cent.....nudda....of which I am particularly proud!!! Even the orchids are out of my mum's lovely Spring garden. 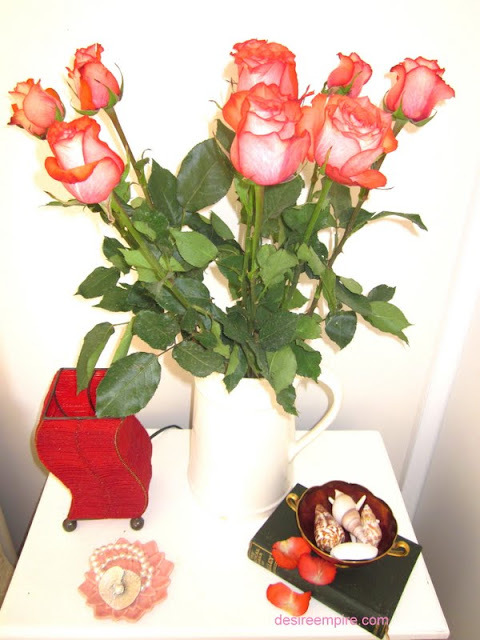 The roses were being thrown out, when I went to the store. I just pulled all the dead petals off and spread them around good side up. It's bright and ultra feminine. I will be very happy in here, until I am forced to change it back to blue, but for now it's staying this way. The second Beach House Brat has already taken up residence in here. She just called out that she is 'reading a Barbie book in bed'. This kiddo knows a bit of luxe when she sees it. And how about the sequined frock? I can believe it fitted me once. Well it will have well and truly turned vintage when the Beach House Brat gets her hands on it, although she is already telling me it's hers. I put the book of Shelley's poetry in here for Mr Beach House. He reliably informs me they are related. Why is it then I ask, that for his website makeover, which is currently going on, that I am having to write all the text. Stay tuned for the launch of that one. Looks like I'll have lots of time this weekend to get more of it done. When I'm not lounging in here next weekend, I'll be hanging out at the local school fair. Hopefully I have a few little vintage finds to report back on and of course I'm still on track for the baking competition. So I'll let you know how that goes. Update on the Beach House Brat: She went quiet, so I just checked on her and she's out for the count. The busy nature of the room didn't keep her awake, so Mr Beach House can have no excuse but to relax in there tonight and enjoy his slumber. What a gorgeous room, enjoy the school fair. I like the pillows with the yellow printed sheets and pillow cases and I love the mirror. The trunk is wonderful. Can't wait to hear what Mr. Beach House has to say. Are you going to share it? Just gorgeous, hanging the red squinned dress, as an artwork, is inspired! 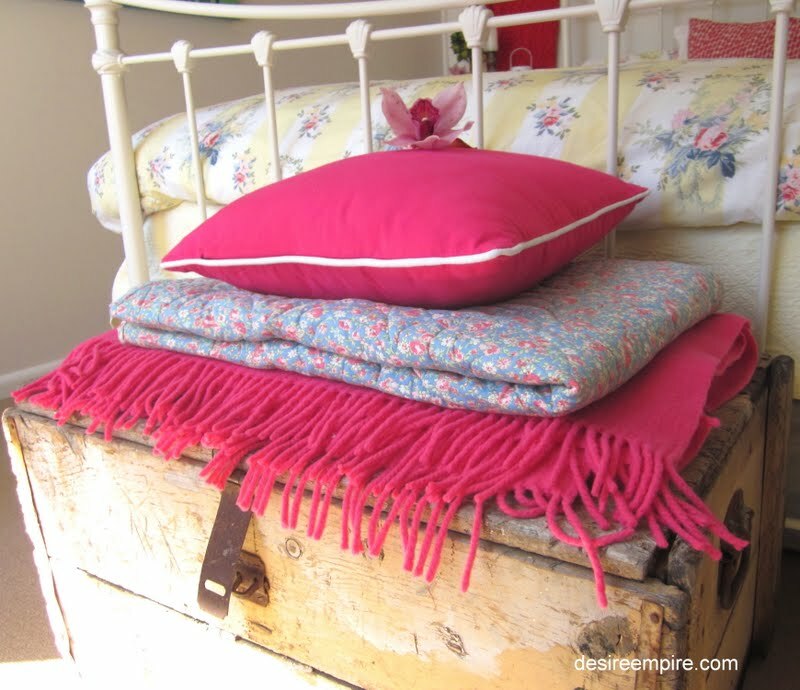 I think I have similar bedlinen to yours, except with a blue ribbon stripe instead of yellow! Getting your Girlie Groove on! Your red cream soup bowl in red is wonderful. Is it marked? Aaawww, what a lovely re-do! "Beach House Brat" made me chuckle! This room is lovely! Great job! What a transformation! It's beautiful and looks like a wonderful place to "chill." I love it !Both are lovely! I love it! It's amazing how different a room can look with just a change of color. What a nice change, and at no extra cost. I just love the yellow, so sunny and happy. I hope you get a turn to spend some time relaxing with a book. I love that yellow, pinks and reds... and your mum's flowers are fantastic! Bunny Jean's Decor and More! So bright, fresh and pretty. What a nice change for spring. Your room looks so beautiful, light and cheery. I love the colors that you added, just perfect for spring. I love it! All that color just pops, and you can't beat red! You have added such special details and the dress is great! 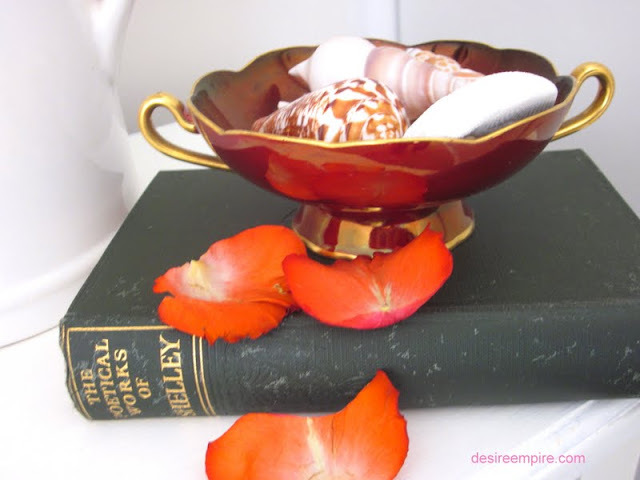 Thank you for linking to Potpourri Friday. Your participation makes for a more successful party. I appreciate you! Beautiful! 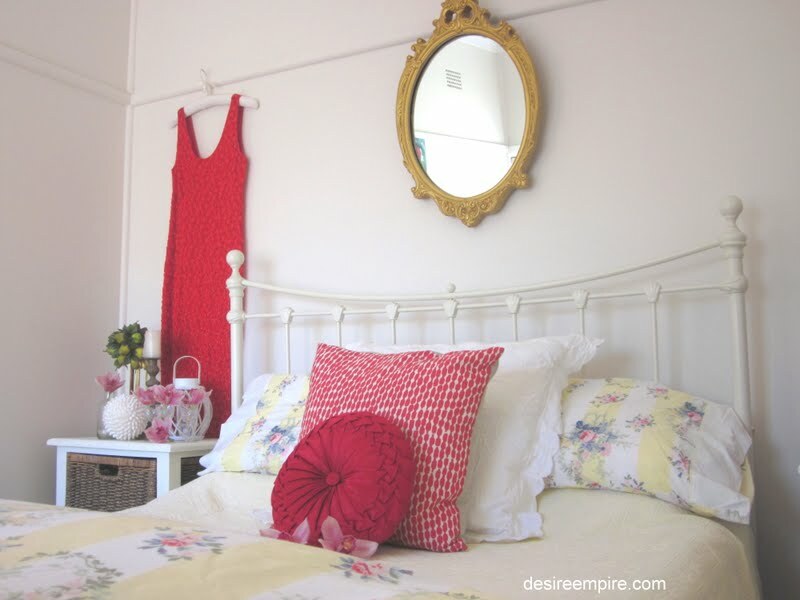 Love all that color and the sweet round pillow, dress on the wall and especially those pretty flowers on the bed. Way to style it! Thanks so much for linking up to share the love Wednesday! So bright and fresh! 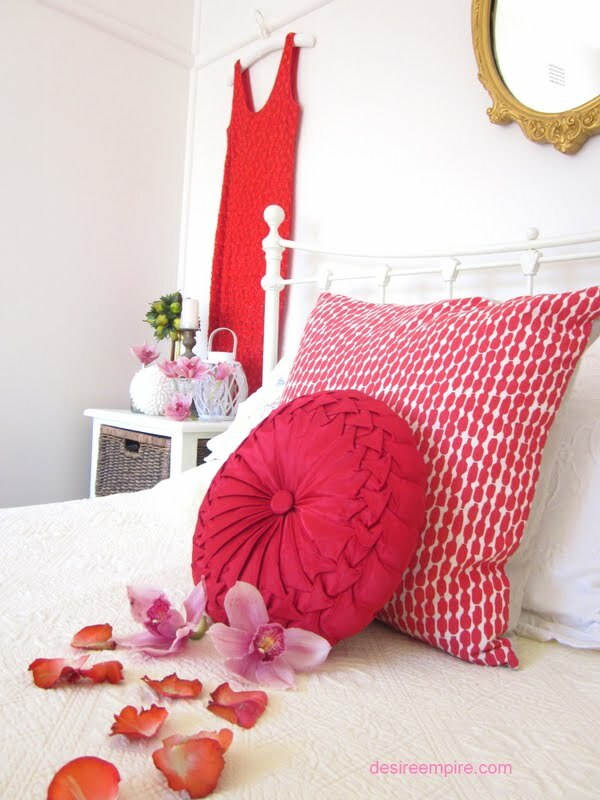 That red pleated pillow is neat! I had to laugh about your husband and football. Sounds like mine. What beautiful pops of color! 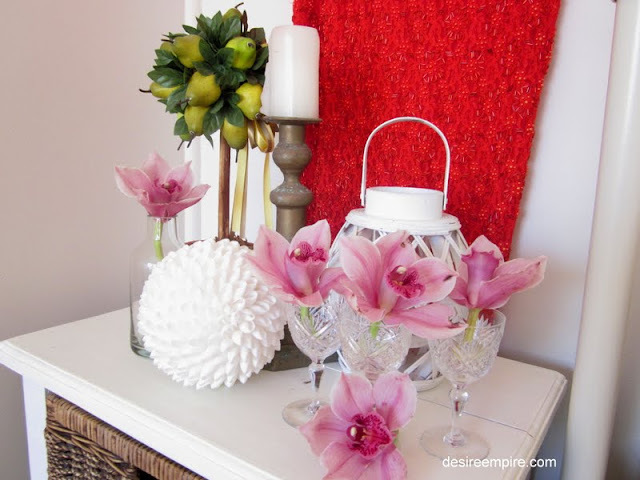 Everything looks bright and cheerful and we are so glad you shared this with us at Inspiration Friday! You did all that in one day?!? You have been a busy bee. 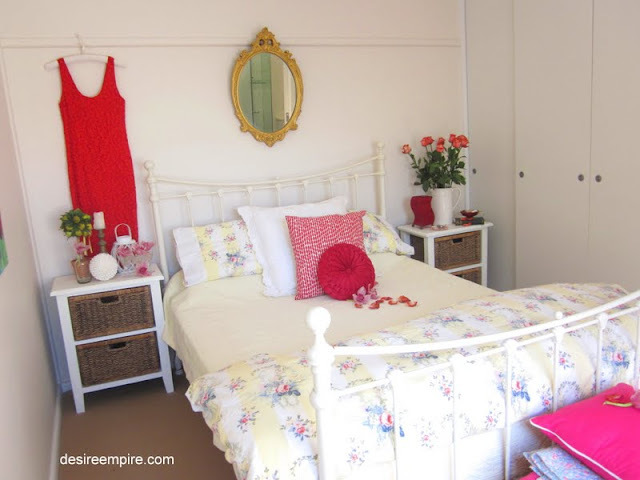 A beautiful makeover of your bedroom. Must have been so much fun! It's just beautiful! Love the colors! Thank you for joining It's a Party! I think your room is gorgeous and your commentary cracked me up! This is just gorgeous! Very girly and glam at the same time. Love the sequined frock. Thank you for joining me at Home Sweet Home! I think the room looks lovely. 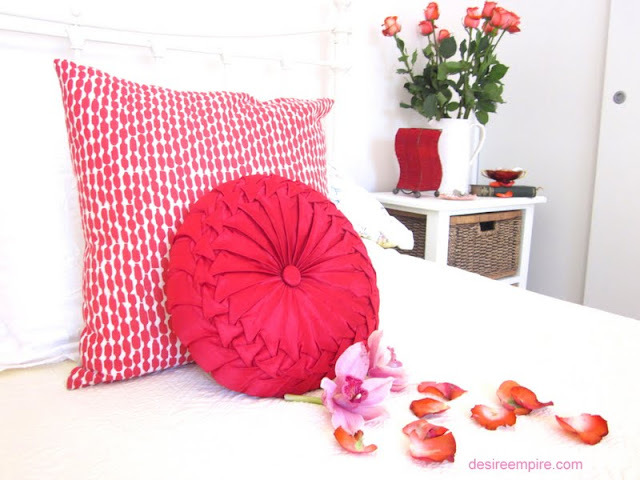 I love the flowers and the bright pillows. What a beautiful room you have, Love it....I wished I could have such gorgeous colours but my boys would make it so dirty within minutes. 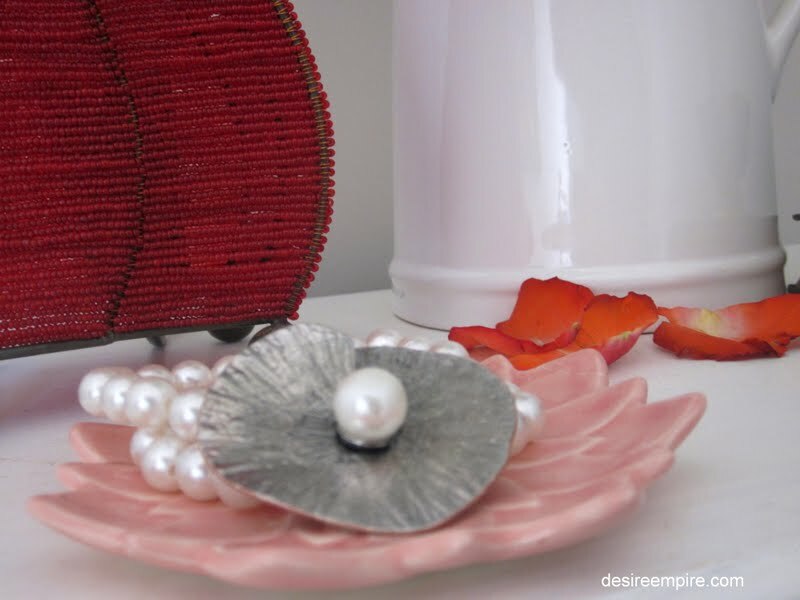 Love your style, and how cool is the make-over without having to spend a cent, love it.